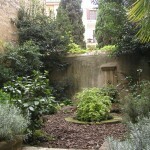 Oo la la …When in France, visit the petit jardin in the courtyard of the Musee du Vieil Aix, 17 rue Gaston de Saporta, Aix-en-Provence, France. The garden is a tiny treasure maintained by a group of dedicated volunteers. I’ve worked with the local volunteer gardeners for a few years – trying to create an inspired garden space. The museum garden offers many challenges. It is viewed from the windows of the museum on all levels, the weather is harsh – with periods of drought, heavy rain, intense heat and sun and funds for plant material and garden maintenance are limited.